I first came to Camp Jewell as a camper in 1968. I loved it so much that I came back every summer through 1978 as a camper, tripper, kitchen staff, junior counselor and counselor. Though a lot has changed since I was a kid, there is a lot that has remained the same, especially the spirit of Camp Jewell and what it offers kids and counselors. That’s why it gives me great pride to send my three kids to camp and it’s a big part of why I have chosen to serve on the Board of Managers. After moving around the U.S. several times for work, my wife, Robyn, and I returned to Stamford, and we started thinking about summer camp and our options for our own children. I came up to visit CJ after having been away from camp for a long time, and immediately that camp feeling came back. After bringing Robyn up to visit, we decided there was no other place we would want to send our kids to camp. So, when our oldest son, Ben, turned 8 he started as a Bandit, and I joined the Board of Managers. Now years later, Ben was a Ranger this past summer (his 10th year), our son Zach will be an L.I.T. (his 8th year) and our daughter Becca will be a Nit Nois (her 4th year). 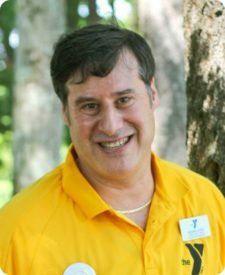 Being on the board has helped me stay connected to camp and what’s happening here, which is important to me as a camp alumnus, but also as a parent. It helps to keep the camp feeling alive for me, it reminds me of how I felt when I was a camper and staff member; it is fun in the same way. That enthusiasm is still here and it makes me want to keep being involved. I really enjoy coming up each session during the summer to help check in campers of all ages, sharing that joy and expectation is a lot of fun. I also like being a part of the Strong Kids Campaign that brings kids to camp regardless of their ability to pay, and I value that the camp continues to make it a priority to bring international staff to camp each summer. Giving kids the opportunity to meet counselors from around the world brings the world a little closer to them. I have three perspectives of camp: that of a camper/staff member, a parent, and a board member. All three perspectives are different, but they overlap in a lot of ways. I want my kids to experience the same things here that I did. Camp helps make kids independent as a result of being in a place where they are protected by the staff but are given the opportunity to really be themselves. When they are at home they have to conform to all the different powers that be, whether it is parents, friends, teachers, etc. When they come here all of that is left at home and they can just be who they want to be. That is the way I felt as a camper, and I know my kids feel that as well. Camp instills respect, responsibility, caring and honesty without campers always realizing that is what is being taught to them. They learn it in fun, creative ways while they are enjoying the Camp Jewell experience. You hear a lot of people talk about how important the friendships they made at camp are to them. It’s the same for me. As a result of being on the Board and being an active part of the camp community I’ve reconnected with some of the campers I grew up with at Jewell. Many are scattered around the country so I don’t see them often, but when I do we instantly re-connect because of the experiences we shared when we were here. Those feelings come right back and bring me back to the great times I had as a camper — even more than three-and-a-half decades after the fact. That’s the power Camp Jewell has and I am really happy my family and I have continued to make Camp Jewell such a big part of our lives.